Tainted by scandal and forced to leave London for the quiet of Brighton, the Honorable Miss Clara DeLancey is a shadow of her former society self. A chance encounter brings her a healing friendship with the sisters of an injured naval captain. But Clara's mama, the Viscountess Winpoole, is appalled at the new company she's keeping. Captain Benjamin Kemsley is not looking for a wife. but his gallant spirit won't let him ignore the penniless viscount's daughter - not when she so obviously needs to be rescued for the despair that threatens her from day to day. Can he protect his heart and still keep her safe? When they're pushed into the highest echelons of society at the Prince Regent's Brighton Pavilion, this mismatched couple must decide if family honor is more important than their hopes. Can they right the wrongs of the past and find future happiness together - without finances, family support, or royal favour? 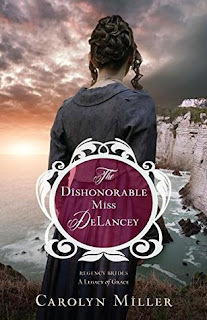 The Dishonorable Miss DeLancey is full of captivating, flawed characters, fascinating historical details, and masterful writing that Carolyn Miller's fans have come to expect. Brilliant. I love the cover, I love the feel of the book, I love its contents. The history, the descriptions, the … people. Referring to them as book characters doesn’t do them justice. They were too real. Every single character was a living, breathing person with their own story. There were laugh out loud moments as I read the interplay between family members. There were moments of triumph and satisfaction as characters were put in their place. The story showed the hypocrisy and danger of valuing money and prestige above character, and enjoying gossip more than compassion and decency. Just when I thought the books in this series couldn’t get any better, this is by far my favourite. I am awed by the author’s knowledge and skill. She has a gift with words that had me soaking up every phrase, enjoying every word as though I was swallowing smooth milk chocolate. From the moment I first held the book in my hands til I read the last word I was captivated. It’s the first time I’ve read historical fiction that compelled me to find out more about the era and Google images to soak up more of the beautiful landmarks and buildings described. The Royal Pavilion in Brighton is just as I imagined after reading the author’s vivid descriptions. The Prince Regent is brought to life in a way that perfectly fits how he is portrayed in the historical reports I found. The story built to an unexpected point of high excitement and drama that had me catching my breath. I was caught in the flow, swept along with the characters. And now I continue to think of them, my life richer for having lived their lives with them over the past few days. What can I say? I loved everything about this book. I am grateful for the gift of creativity, expression and understanding of God and people this author has been given. I am grateful to have been blessed by God and touched by it through this book. Carolyn Miller's books can be purchased from Amazon and Koorong. This book makes me even more keen to come to your workshop at conference. I know I have so much I can learn from you! Great review! I've just downloaded the first book in the series and am looking forward to reading it!